Whoa!!! I did not see any of that coming. 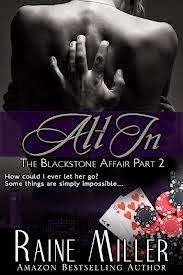 So many unexpected things happened in this third book of the Blackstone Affair Series. The beginning of this novel was very sweet as Ethan interacts is with his little niece Zara as he and Brynne have escaped the hustle and bustle of London and enjoying the country life at his sister’s home. While visiting, Brynne has accepted Ethan’s proposal but is having some bouts of illness accompanied by fatigue and Ethan’s sister makes an observation that alters the direction of their lives. Upon returning to London, Brynne is busy preparing for her future when she receives some earth shattering news that forces her to return to the states with Ethan in tow to face some horrible truths. However, after this truth Brynne and Ethan are faced with the now known threat who was not at all who or what they expected it to be. The ending of this book felt a little rushed with A semblance of a Happy Ending but I felt as though I missed something. Like there was something peculiar that took place so I read the last few chapters again...and again... and one more time to prove that I didn't miss anything. However, after reading it that one last time I realized that I didn't miss anything and something else needs to happen, should happen, like what just happened. Why did I have this feeling of incompleteness, you may ask? Well, I will tell you. The reason I was longing for that something else was because Mrs. Miller had set me up for the fourth book that comes out TODAY, February 28, 2014. So if you haven't gotten your copy of Rare and Precious Things... go and get it!!! and hearts, so at the very least I had to find out if there was structural damage as a result of Ethan's fist meeting the wall at his office. So, I continued on reading and I must say I was not disappointed. I was pleased to see that this book was a little longer and had a lot more drama and such. Now that Brynne knows that her father has hired Ethan to watch over her because of an unknown threat to her safety, the young and eager couple is at an impasse, a sink hole, you can say, in the road to their HEA.These two go 10 long days without seeing each and after Ethan sought refuge and advice from his father, he decides to write Brynne a letter and wait. Brynne calls Ethan after she receives the flowers and this is when their story begins again. Ethan feels Brynne needs him and rushes off to meet her and they reunite as Brynne explains things that have been occurring and Ethan is in full fix-it mode. In this installment Ethan finally knows Brynne's secret and vows to tear down hell and high water to keep her safe while battling his own demons. The deeper their feelings get and their connection grows Ethan is haunted by images of his own past. All in all this book had a tad bit of suspense, tons of drama, the usual kinkiness you could expect from this genre, a dash of romance, precious moments and promises of forever. I liked it and again the story line was a pleasant surprise. On to the next one with Eyes Wide Open coming up!